According to a 2014 opinion poll, 22.8% of Northern Ireland Catholics described themselves as “British”. The poll also revealed that 20.6% of Roman Catholic’s wanted Northern Ireland to remain an integral part of the UK. That is almost over one fifth of NI’s Catholic population. A surprising and extraordinary statistic, or at least it will be to some people. There have however, always been Catholic Unionists, some of them very prominent, although in recent years the number of Catholic Unionists, and Catholic Loyalists, seems to have increased. In October, 2017, Stephen McCarthy was co-opted unto Antrim and Newtownabbey Council, as an Ulster Unionist Party councillor. Nothing unusual? Well, actually Cllr. Stephen McCarthy is a little unusual. A former altar boy, he grew up a Catholic in the republican stronghold of West Belfast, growing up in the St James area before moving to the Short Strand. His grandfather was shot dead in 1991 by the UVF while working as a taxi driver. He joined the UUP aged 19 despite coming from what he is on record as describing as an “SDLP family”. In an interview with the Irish News Cllr. McCarthy stated- “There are many Unionists in the Catholic community.” Adding that he is a Unionist principally for “economic reasons” but also that he feels “both British and Irish”. Cllr. McCarthy is not unique and in the coming years and decades there will be many more like him. Unionism and Loyalism, despite the vitriol of the usual suspects, has never been about religion. As time moves on and religion becomes less and less important in people’s lives, an increasing number people will base their political opinions, not on the traditional outlook of their parents or grandparents, but on their own thoughts, feelings and aspirations. Those 20.6% of Catholic’s who said they wanted Northern Ireland to remain part of the UK are, very obviously, Unionists, even if many would be reluctant to describe themselves as such. It is interesting that the 2014 poll also revealed that there were more than twice as many Catholic Unionists as there were “Protestant Irish nationalists”. Again, for some that will no doubt be surprising, and troubling. For a significant proportion of Irish nationalists and republicans, that 20%+ of Catholics who are also pro-Union, are traitors. Many Catholic Unionists hide their real political leanings, sometimes even from their own families, for fear of becoming pariahs. Like it or not, believe it or not, the “CNR” community is much more tribalistic and insular than the “PUL” community. That is an uncomfortable truth, but it is one that nationalists and republicans are going to have to come to terms with. “The proof of the pudding is in the eating” as the saying goes. We will see then, which political camp really is the most tribal and sectarian over the course of the coming years and decades. I am confident that as the number of Unionists and Loyalists from outwith the Protestant community continues to grow, that it will be Irish nationalism which will be exposed as the sectarian, intolerant and parochial doctrine Loyalists have always known it is. But what if there was an Irish nationalist majority in 2016, or 2020? What if, say, 60% of the populace voted to amalgamate NI into an all-island Irish republic? What would the consequences be? Irish nationalists & republicans (who must be given credit for their eternal optimism if nothing else) seem to assume that all of the problems in ‘the North’ would simply evaporate, like morning mist & everything in the garden would be rosy! Would it be though? There are many Loyalists (myself included) who will never accept a unitary all-island state, under any circumstances. Will people like me simply shrug our shoulders, sigh, then quietly take the next boat out of Larne? Or is it far more likely that Loyalist militants will take up arms & began a brutal, prolonged & costly ‘armed struggle’ against this hypothetical ‘united Ireland’? The hopelessly optimistic republican will, no doubt, argue that such an insurgency would be easily & quickly quelled, but would it? Supposedly the Provisional IRA never numbered more than about 1200 active members, even at the height of ‘The Troubles’, the OIRA, INLA, IPLO etc, each numbered 200-300 active members, yet the republican death squads managed to cost the UK quite a few troops & a massive amount of money (along with the mass of civilians such groups targeted & killed) How would our hypothetical Irish state cope with, estimating conservatively, 5 or 6 thousand armed Loyalists? I would propose that the outcome would not be good, for anyone. The Irish Defence Forces & An Garda Síochána would have to be hugely enlarged. Garda stations would have to be fortified (at huge cost) Not to mention the financial drain of constantly repairing bomb damage & paying out compensation to the families of victims. Short of ethnically cleansing the entire Loyalist/Unionist population, an aspiration quietly harboured by many Irish nationalists, there would be no military victory in such a scenario (for an example, see Northern Ireland, 1969- present) There would be only ‘War Without End’. So, if the so-called ‘demographic argument’ (i.e. the sectarian argument) does not hold up to scrutiny & if, even with a nationalist/republican majority, Loyalist reaction would make any unitary state unworkable, how do Irish nationalists propose to bring about this ‘united Ireland’ they wax lyrical about so often? The only realistic option is for Irish nationalists & republicans is to ‘persuade’ the U/L community that an artificial 32 county state would be advantageous, to woo the pro-Union population into accepting such a state. That is something the SDLP & others recognised years ago, it is something that Provisional Sinn Fein are also now coming to realise too. Therein lies the paradox though. For over 40 years ( or over 400 years?) 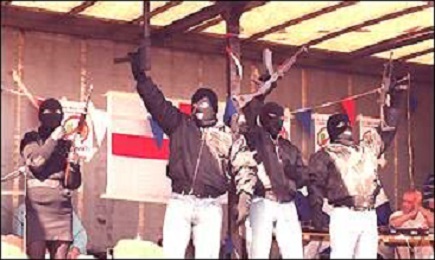 Irish nationalism has been attacking the U/L community, physically, culturally, politically & economically. So how does one change that mindset & convince one’s followers that Unionists & Loyalists now must be embraced? It seems like an impossible task. It looks even more unlikely when one considers the attitude of many senior members of PSF! A ‘united Ireland’ cannot be achieved without, at least, the tacit approval of the majority of Unionists, but Unionists will never give such approval unless Irish nationalism can convince Unionists that they would be fairly treated, influential, well represented & financially secure within such a state. Something that would be difficult for the leadership of Irish nationalism, given the dark past of many of those leaders, & is completely impossible for the rank & file, who have, for decades, been indoctrinated to think of their Unionist/Loyalist neighbours as lesser beings. Then, of course, one can add to the problem, the pressure being put on PSF, SDLP etc, by those rank & file nationalists/republicans, to stop Unionist/Loyalist parades in supposedly ‘contentious’ areas, remove outward symbols of Britishness etc. Such cultural attacks are doing nothing to convince the U/L people that they would be better off in an artificial 32 county Irish/Gaelic state. The leadership of Irish nationalism cannot reverse this cultural war though, for to do so would be to play into the hands of the Dissidents, further empowering those groups & further weakening Sinn Fein & the SDLP. Such is the Irish nationalist paradox. Most Irish nationalists will still argue that demographics will deliver an all-island republic in the next 20-50 years, that Unionists & Loyalists will, stripped of British support, be left with no other option but to accept the new political reality, embrace their latent ‘Irishness’ & thus remove the conditions for any armed insurrection. This is fairytale politics, it is utter fantasy. Firstly, the longer NI exists as a polity, the harder it will be to persuade people to dismantle the status quo, dissolve the state & jump, feet first, into a new political construct. Secondly, I must remind everyone that Catholic does not equal Irish nationalist (nor does Protestant equal Unionist) Thirdly, even if (& it’s a big if) a large section of Unionists/Loyalists did accept some form of all-island state, a large section won’t, never will & will use ‘direct action’ to prevent it, or to destroy such a state in it’s infancy. Finally, the Irish nationalist paradox will not be resolved anytime soon. If the U/L community cannot be ‘outbred’ (a disgusting term republicans like to employ), cannot be ethnically cleansed or militarily conquered, (& I would argue they cannot) then a ‘united Ireland’ is rendered near impossible, since ‘persuading’ Loyalists & Unionists to voluntarily enter into a all-island state, could take a few centuries, not a few decades!